CFA variations must comply with certification/exception reporting and be administered through the DHB Quarterly Reporting Database. Most reporting should be six-monthly or annually, with more frequent reporting by exception only (e.g. high risk or by Ministerial or Cabinet direction). The first step in creating certification/exception reporting requirements is to set the reporting frequency. Reporting frequency needs to be justified by taking account two main factors, total funding allocation and risk of non-delivery or poor performance. This justification should be documented in the Business Case. Detailed justification will be expected if the reporting frequency does not align with these guidelines. Once the frequency of reporting has been determined, milestones/targets should be negotiated with the DHB for the certification reports. These must directly relate to the service requirements in the CFA variation. The DHB will certify that the milestones/targets have been reached in a simple report through the DHB Quarterly Reporting Database. Please note that failure to reach agreement with DHBs on reporting targets could cause delays in the execution of the CFA Variation. a time frame for meeting the milestones/targets. All information required in the exception report should be detailed in the reporting clause of the CFA variation. Additional reporting requirements may be required in rare cases. This is reporting that does not comply with certification/exception reporting. This must be justified in the Business Case. Justification for additional reporting may include Ministerial or Cabinet direction or where reporting is directly linked to payment of funding. The justification will be filed alongside the CFA variation in the CFA Tracking Database. The level of authority required for certification will take account two main factors, total funding allocation and risk of non-delivery or poor performance. Ultimately, it is up to the Variation Owner and their group manager to decide the appropriate governance level required for the certification report. There are instances where a report is considered an output (or deliverable) and would not fall under these guidelines. This may include business cases or reporting that is linked directly to payment of funding. In this case, the DHB must be allocated sufficient funding to deliver the reporting as an output requirement of the CFA Variation. 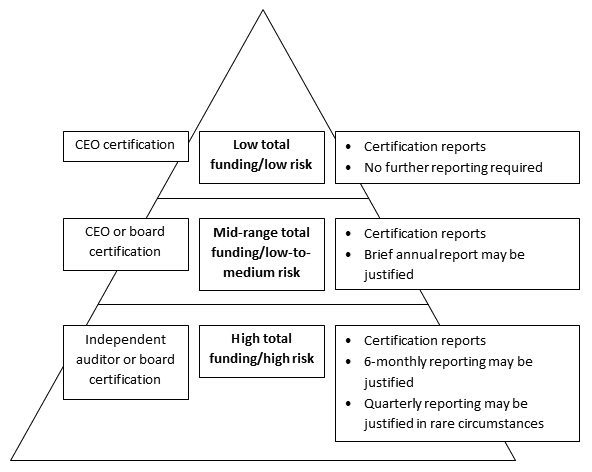 The reporting diagram can be used as a guide for determining the appropriate type, frequency, and level of certification of CFA variation reporting in relation to total funding allocation and risk. Funding levels refer to total programme or national-level funding, not DHB-level funding. There may be justification for independent audit of confirmation reports in any CFA variation. This should be agreed to by the DHB and documented in the CFA variation.